iOS 7 is the seventh major release of the iOS mobile operating system developed by Apple Inc., being the successor to iOS 6. It was announced at the company's Worldwide Developers Conference on June 10, 2013, and was released on September 18, 2013. It was succeeded by iOS 8 on September 17, 2014.
iOS 7 introduced a completely redesigned user interface, a design credited to a team led by Apple's senior vice president of design, Jony Ive. The new look, featuring flatter icons, a new slide-to-unlock function, and new animations, was described by Ive as "profound and enduring beauty in simplicity". The new design was implemented throughout the operating system, including the Notification Center, which was updated with three tabs offering different views of information; notifications visible on the lock screen; a redesigned Siri voice assistant offering visual indicators; and a Control Center offering easy access to the most commonly used features. iOS 7 also introduced AirDrop, a wireless sharing technology; CarPlay, phone and car integration; and automatic app updates in the App Store. Reception of iOS 7 was mixed. The new design language was criticized, with critics noting the implementation of design changes rather than actual productivity improvements, and citing examples such as animations delaying access, lack of icon consistency, and buttons being hidden as negative aspects of the user experience. The addition of the Control Center was praised, as were updates to Siri and multitasking. Shortly after release, there were reports of the new design causing sickness, a trend explained as being caused by animations with similar effects as car sickness. User adoption of iOS 7 was fast. Its iOS market share was reported to be as high as 35% after one day, and installed on 200 million devices within 5 days, which Apple claimed was "the fastest software upgrade in history." iOS 7 was introduced at the Apple Worldwide Developers Conference on June 10, 2013. A beta release was made available to registered developers after the announcement. iOS 7 was officially released on September 18, 2013.
iOS 7.0.1 was released on September 20, 2013, specifically for the iPhone 5C and iPhone 5S. The update included bug fixes that allow users to purchase iTunes content with the Touch ID fingerprint recognition scanner rather than with a passcode. iOS 7.0.2 was released on September 26, 2013. The update fixed bugs that could allow someone to bypass the lock screen passcode, and reintroduced a Greek keyboard option for passcode entry. iOS 7.0.3 was released on October 23, 2013, with support for the iPad Air and iPad Mini 2. It also included support for iCloud Keychain, a password generator for the Safari web browser, updated the lock screen with a delay of the "Slide to Unlock" text when Touch ID is in use, and many bug fixes. iOS 7.0.4 was released on November 14, 2013, with bug fixes addressing some FaceTime calls failing. iOS 7.0.5 was released on January 29, 2014, with a fix correcting network provisioning for some iPhone 5S and iPhone 5C models in China. iOS 7.0.6 was released on February 21, 2014, with a fix for an SSL connection verification issue. iOS 7.1 was released on March 10, 2014. The update included improvements to the Touch ID fingerprint technology, support for CarPlay, and a fix for a home screen crash issue. It also brought visual updates for the shift and caps lock keys on the keyboard, refined icons for several of Apple's standard apps, and a redesign for some aspects of the Phone dialer and shutdown screens. iOS 7.1.1 was released on April 22, 2014, with a few bug fixes. iOS 7.1.2 was released on June 30, 2014, with bug fixes and improved iBeacon connectivity and stability. iOS 7 introduced a complete visual overhaul of the user interface. With "sharper, flatter icons, slimmer fonts, a new slide-to-unlock function, and a new control panel that slides up from the bottom of the screen for frequently accessed settings", the operating system also significantly redesigned the standard pre-installed apps from Apple. Jony Ive, Apple's head of design, commented that "There is a profound and enduring beauty in simplicity, in clarity, in efficiency. True simplicity is derived from so much more than just the absence of clutter and ornamentation - it's about bringing order to complexity. ... iOS 7 is a clear representation of these goals. It has a whole new structure that is coherent and applied across the entire system." iOS 7 introduced AirDrop, a wireless sharing technology accessible from the share icon, which lets users send files from their local device to other, nearby iOS devices. It can be enabled in the Control Center, with options for controlling its discovery by other devices, including Off, Contacts Only, and Everyone. At launch, AirDrop was only available on the iPhone 5 and later, fourth-generation iPad and later, all iPad Minis, and the fifth-generation iPod Touch. iOS 7 introduced the Control Center, a menu that users can access by swiping up from the bottom of the screen, providing access to frequently used settings such as Airplane Mode, Wi-Fi, Bluetooth, Do Not Disturb Mode, and Rotation Lock. There is a slider for adjusting screen brightness, controls for music playback, along with a volume slider. A Flashlight toggle is also available, as is an icon for quickly accessing the camera. iOS 7 overhauled the Notification Center, with both visual and functional changes. It has three tabs; "Today" (information on what's coming during the day), "All", and "Missed". Notifications are now visible on the phone's lock screen, and notifications are synchronized across devices, so users don't need to dismiss the same notification multiple times on different devices. iOS 7 expanded the screen for app switching. Users double-tapped the home button and were taken out of the current app for a view of full-screen thumbnails of recently accessed apps. CarPlay (formerly iOS in the Car), released as part of iOS 7.1, integrates with selected car models to offer phone interaction, including music controls and Maps navigation, through the car's display. Users can also talk to Siri to send messages hands-free. It supports all Lightning-equipped iPhones with iOS 7.1 or later. Siri features a new design where the assistant fades in with the background app being blurred. While speaking, visual vocal waves appear, that form into a spinning circle as the device communicates with Apple's servers. Siri can now control a limited set of device settings, including Bluetooth. The assistant can alternatively send the user directly to the settings menu if their query cannot be controlled by voice, or otherwise, displays an error if the request can't be processed. For searching the Internet, Bing became the default search engine, and Siri's web resources were expanded to include Wikipedia. Siri was also more deeply connected into Twitter, offering full tweet search. iOS 7 also allowed the user to change Siri's gender, with new options for male and female voices. Spotlight search is accessed by holding and dragging down the home screen. iOS 7 came with new wallpapers that included a "Parallax" effect; the icons appear to be moving as the user moves the phone around, producing an "illusion that the icons are floating above the background wallpaper". In Settings, users have the option to make custom vibrations for certain types of notifications, turn off the parallax wallpaper animation effect using a Reduce Motion setting, and block callers, with the block applying across multiple devices and apps, including Phone, Messages, and FaceTime. On the home screen, newly installed apps and recently updated apps have a blue dot next to them until the user opens the app for the first time. Folders are updated to incorporate different pages, similar to the home screen layout, allowing for a significant expansion of folder functionality. Each page of a folder can contain up to nine apps, and there can be 15 pages in total, allowing for a total of 135 apps in a single folder. The App Store received several significant changes in iOS 7. Users can enable automatic app updates. Users can now view a history of updates to each installed app. With location services enabled, the App Store has a Near Me tab that recommends popular apps based on the user's geographic location. It also became possible to download older versions of apps, in case new iOS versions left older devices incompatible for system updates, allowing users to maintain a working copy of the last supported update of each app. iOS 7 introduced a square photo mode for the Camera app, enabling "Instagram-style photos". Also new are live filters; nine different filter options that each change the photo's appearance. Further improvements to the camera included the ability to pinch-to-zoom during video recording, and a Burst mode for easily taking successive photos by holding the shutter button, causing the phone to take 10 frames per second. On the iPhone 5S, a slow-motion video option was added, with the ability to shoot a video at a high frame rate of 120 frames per second. It can be edited in the Photos app, where users can decide where to start and end the slow-motion part. The Photos app was updated with new categorization options. Three tabs on the bottom, "Photos", "Shared", and "Albums", each open to new windows featuring galleries. On the main Photos interface, the app displays a timeline of all photos, sorted into "Years", "Collections", and "Moments". Filters were added, allowing users to choose from several types of filters to add to their photos. Alongside existing options for sharing pictures, the app was updated with support for the new AirDrop functionality. The Music app integrated Apple's iTunes Radio service; a station-based music service that let users choose an artist, with the service generating a "station" based on that and similar artists' songs. Users were able to skip songs and search through the history of previous songs, in addition to being able to purchase the songs directly from the iTunes Store while playing. iTunes Radio also had a feature that showed songs currently trending on Twitter. iTunes Radio was free and ad-supported, but users could subscribe to iTunes Match, that enabled ad-free playback. After more than two years of release, iTunes Radio was eventually discontinued in January 2016, with the features moving to the new Apple Music music subscription service and Beats 1 radio station. In iOS 7, the Safari web browser received multiple significant updates. The two search bars found in previous iterations of the browser have been combined into a single "Smart Search" field. Tab management was improved to allow more than eight open tabs at once, as well as stacking tabs on top of each other vertically as opposed to a horizontal card view. The option to enter a Private tab was built into the app itself rather than in Settings menus, and a new "Do Not Track" button allows the user to further manage their privacy levels. Apple Maps now features turn-by-turn walking directions. The design of Maps was updated to feature a full-screen view, where interface elements such as the search bar disappear from view, alongside new translucent search and lower toolbars, and a Night Mode that automatically activates when users drive at night. A separate Siri volume control is available in Maps, enabling users to "change the relative volume of Siri's voice feedback independently of the system volume, so it doesn't shout too loud over your background music". The Weather app on iOS 7 received significant changes, including a new icon, the absence of a static weather indicator on the app thumbnail on the home screen, and new dynamic, visual representations of the current weather. iOS 7 has its own FaceTime app on iPhone, with FaceTime Audio, a feature that allows users to call while on Wi-Fi. FaceTime Audio is accessible from the Phone app, the Contacts app, or the FaceTime app itself. It is available on devices running iOS 7 or later. The Messages app allows users to see timestamps for every message they have sent or received. The Verge wrote that the 2013 iOS redesign's flat, minimalist design language was informed by apps including the 2013 word game Letterpress (pictured). The reception of iOS 7 was mixed. Mark Rogowsky of Forbes criticized multiple aspects of the new design, including the 3D effect on the home screen wallpaper, writing that "the interaction between iOS 7 and the screen background is challenging at best", and writing that the new overall design language for the operating system "now has your icons fly into the screen whenever you unlock it like some kind of videogame effect. It's pointless, delays your access to the phone by a fraction of a second and is arguably distracting". Joshua Topolsky of The Verge also criticized the design, noting lack of icon consistency in different parts of the OS, as well as writing that "instead of correcting issues with the notification panel and alerts, Apple has simply given them a fresh coat of paint and several layers of sub-navigation [...] doing nothing to actually speed up your productivity on the device." The Nielsen Norman Group, a research company, wrote an extensive report on the user-experience of iOS 7, summarizing the report as "Flat design hides calls to action, and swiping around the edges can interfere with carousels and scrolling." David Pogue of The New York Times, however, liked the minimalist design of iOS 7, writing that "The longer you spend with the new OS, the more you're grateful for the fixing and de-annoyifying on display", and that "you can swipe upward from the bottom of the screen to open the Control Center: a compact, visual palette of controls for the settings and functions you're most likely to need". He also praised the improvements to the Siri voice assistant, writing that Siri "is much better". He concluded by writing: "The structure, layout and features represent some of Apple's best work. The look of iOS 7 — well, that judgment is up to you." Darrell Etherington of TechCrunch focused on many of the new features introduced, praising the Control Center as being "incredibly useful", AirDrop as being "great" (although noting the lack of interoperability between iOS and Mac at the time), Siri as being "more generally useful", and the new multitasking features as "smarter", with the multitasking screen being "much better". In conclusion, he wrote that "There's no question that iOS 7 will be a dramatic change from the iOS many users already know and love, but on balance it's an update packed with plenty of new features that make using Apple's mobile devices easier and more enjoyable". 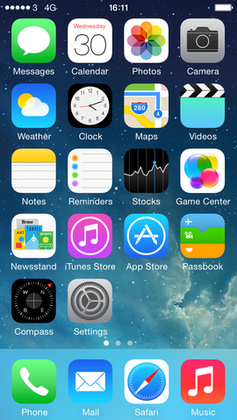 Some critics noted the influence of competition from other mobile platforms on the design and functionality of iOS 7. Of note were the use of concepts from Android and Windows Phone, such as a similarly minimal and typographic design, Control Center being an equivalent to similar settings toggles on the notification shade of Android, a similar multitasking menu to WebOS, and even the design of the Weather app being almost identical to those on Windows 8 and HTC Sense. Sascha Segan of PC Magazine stated that "Apple's brilliance is in putting the pieces together and marketing them. Apple's developer APIs and its history of making money for developers still reign supreme—there's less piracy than on Android, and a bigger audience and more design flexibility than on Windows Phone." The adoption rate of iOS 7 was reported to be as high as 35% after one day. Within five days, iOS 7 was installed on more than 200 million devices, which Apple claimed was "the fastest software upgrade in history." In August 2014, it was reported that 91% of iOS devices ran iOS 7 at the time. In September 2013, Pranav Dixit of Fast Company reported about user complaints shared on Apple's support forums that the new design of iOS 7, including "many zoom animations while multitasking and opening and closing apps, in addition to a slight parallax effect" were causing users to feel sick. Dixit noted that while the parallax effect could be turned off, most animations did not have such an option. Dr. George Kikano, "division chief of family medicine at UH Case Medical Center in Ohio", told Fox News that "There’s some validity to this, for people who are susceptible." Fox News wrote that Dr. Kikano said "It's a new "parallax" function that causes the background of the phone to subtly move back and forth, a feature that leads to an effect not unlike car sickness. The inner ear is responsible for balance, the eyes for vision. When things are out of sync you feel dizzy, nauseous. Some people get it, some people don't, and some people get used to it." Adrian Kingsley-Hughes of ZDNet wrote in March 2014 that iPhone and iPad users reported battery drain with the iOS 7.1 update. In lab testing, Andrew Cunningham of Ars Technica found some hardware models experienced minor battery depletion, while others experienced no statistically significant changes. Dom Esposito of 9to5Mac reported in June 2014 that a new lock screen bypass method had been discovered in iOS 7, allowing access to the phone in "5 seconds under certain circumstances". The issue was later fixed. During the iOS 7 release, fake advertisements claimed that the update would cause devices to become waterproof, and that AirDrop was a mechanism for protecting the device's screen from breaking when dropped. With this release, Apple dropped support for older devices, specifically the iPhone 3GS and the fourth-generation iPod Touch. ^ Hall, Zac (September 9, 2014). "Apple releases iOS 8 GM ahead of Sep. 17 public release". 9to5Mac. Retrieved December 30, 2016. ^ a b Seifert, Dan (June 10, 2013). "Apple announces iOS 7, 'biggest change' since the introduction of the iPhone, coming this fall". The Verge. Vox Media. Retrieved December 29, 2016. ^ Souppouris, Aaron (September 10, 2013). "iOS 7 will come to iPhones and iPads on September 18th". The Verge. Vox Media. Retrieved December 29, 2016. ^ Kingsley-Hughes, Adrian (September 20, 2013). "Apple releases iOS 7.0.1 to patch fingerprint scanner bug". ZDNet. CBS Interactive. Retrieved December 29, 2016. ^ Cunningham, Andrew (September 26, 2013). "Apple fixes a pair of lock screen bugs with iOS 7.0.2 update". Ars Technica. Condé Nast. Retrieved December 29, 2016. ^ Bora, Kukil (October 23, 2013). "Apple iOS 7.0.3 Released With Many New Features, Improvements And Fixes As iOS 7 Now Runs On 64% Of Devices". International Business Times. IBT Media. Retrieved December 29, 2016. ^ "Apple releases iOS 7.0.4 to address FaceTime bug, other issues". AppleInsider. November 14, 2013. Retrieved December 29, 2016. ^ Clover, Juli (January 29, 2014). "Apple Releases iOS 7.0.5 for iPhone 5s/5c With Fix for Network Provisioning in China". MacRumors. Retrieved December 29, 2016. ^ Clover, Juli (February 21, 2014). "Apple Releases iOS 7.0.6 With Fix for SSL Connection Verification". MacRumors. Retrieved December 29, 2016. ^ Kastrenakes, Jacob (February 21, 2014). "Apple releases iOS 7.0.6 with fix for security issue". The Verge. Vox Media. Retrieved December 29, 2016. ^ Clover, Juli (March 10, 2014). "Apple Releases iOS 7.1 With CarPlay, Touch ID Improvements, Visual Tweaks". MacRumors. Retrieved December 29, 2016. ^ Warren, Tom (March 10, 2014). "Apple releases iOS 7.1 with reboot fix, UI tweaks, and CarPlay". The Verge. Vox Media. Retrieved December 29, 2016. ^ Clover, Juli (April 22, 2014). "Apple Releases iOS 7.1.1 With Touch ID Improvements, Bug Fixes". MacRumors. Retrieved December 29, 2016. ^ Clover, Juli (June 30, 2014). "Apple Releases iOS 7.1.2 With Mail Fixes, iBeacon Improvements". MacRumors. Retrieved December 29, 2016. ^ Heater, Brian (June 10, 2013). "Apple shows off completely redesigned iOS 7 at WWDC, coming this fall". Engadget. AOL. Retrieved December 29, 2016. ^ Cipriani, Jason (September 23, 2013). "Getting to know AirDrop on iOS 7". CNET. CBS Interactive. Retrieved December 29, 2016. ^ "Share content with AirDrop on your iPhone, iPad, or iPod touch". Apple Inc. February 1, 2017. Retrieved February 18, 2017. ^ Oram, Adam (March 11, 2014). "How To: Use AirDrop in iOS 7". Today's iPhone. PhoneDog. Retrieved February 18, 2017. ^ Guarino, Sarah (September 18, 2013). "iOS 7 How-to: Use Control Center to quickly manage settings". 9to5Mac. Retrieved December 29, 2016. ^ a b Guarino, Sarah (September 20, 2013). "How-to: Use the new Camera app in iOS 7". 9to5Mac. Retrieved December 29, 2016. ^ "Apple debuts iOS 7, OS X Mavericks, and new Macs: everything you need to know". The Verge. Vox Media. June 10, 2013. Retrieved December 29, 2016. ^ Friedman, Lex (September 18, 2013). "Get to know iOS 7: Notification Center". Macworld. International Data Group. Retrieved February 5, 2017. ^ Guarino, Sarah (September 18, 2013). "iOS 7 How-to: Use the new multitasking interface". 9to5Mac. Retrieved December 30, 2016. ^ Moren, Dan (September 18, 2013). "Get to know iOS 7: Multitasking". Macworld. International Data Group. Retrieved December 30, 2016. ^ Molen, Brad (March 10, 2014). "Apple releases iOS 7.1 with CarPlay support". Engadget. AOL. Retrieved December 30, 2016. ^ Mayo, Benjamin (March 3, 2014). "Apple rebrands iOS in the Car as CarPlay, compatible vehicles launching later this year". 9to5Mac. Retrieved December 30, 2016. ^ Caldwell, Serenity (September 18, 2013). "Get to know iOS 7: Siri". Macworld. International Data Group. Retrieved December 30, 2016. ^ Cipriani, Jason (September 19, 2013). "How to change Siri's voice on iOS 7". CNET. CBS Interactive. Retrieved December 30, 2016. ^ Kazmucka, Allyson (September 18, 2013). "How to access and use Spotlight search on your iPhone or iPad". iMore. Retrieved December 30, 2016. ^ Andronico, Michael (September 20, 2013). "How to Use Spotlight Search in iOS 7". LaptopMag. Retrieved December 30, 2016. ^ Allain, Rhett (September 26, 2013). "Parallax and the iOS 7 Wallpaper". Wired. Condé Nast. Retrieved December 30, 2016. ^ Moss, Caroline (September 29, 2013). "Here's How To Create Custom Vibration Patterns To Use As Ringtones In iOS 7". Business Insider. Axel Springer SE. Retrieved December 30, 2016. ^ Ghani, Uzair (October 19, 2013). "Top 23 Hidden iOS 7 Features That You Likely Don't Know About [Updated]". Redmond Pie. Retrieved February 5, 2017. ^ Bostic, Kevin (September 19, 2013). "iOS 7 feature focus: Block calls, texts, and FaceTimes from individual numbers". AppleInsider. Retrieved February 5, 2017. ^ Broida, Rick (September 20, 2013). "Five quick iOS 7 mysteries solved". CNET. CBS Interactive. Retrieved May 23, 2017. ^ Costello, Sam (March 20, 2017). "How Many Apps and Folders Can an iPhone Have?". Lifewire. Dotdash. Retrieved October 15, 2017. ^ Cole, Shane (September 18, 2013). "iOS 7 feature focus: App Store auto-updates and iTunes Radio". AppleInsider. Retrieved July 20, 2017. ^ Kastrenakes, Jacob (June 10, 2013). "App Store will update apps automatically in iOS 7". The Verge. Vox Media. Retrieved July 20, 2017. ^ Benjamin, Jeff (April 19, 2014). "iOS 7: the ultimate App Store guide". iDownloadBlog. Retrieved December 29, 2016. ^ Ulanoff, Lance (September 17, 2013). "Apple App Store Introduces Legacy App Download Option". Mashable. Retrieved December 31, 2016. ^ Cipriani, Jason (September 18, 2013). "Five tips for the new Camera app on iOS 7". CNET. CBS Interactive. Retrieved December 29, 2016. ^ Macro, Ashleigh (November 8, 2013). "How to use Slo-Mo in iPhone 5s: make slow-motion videos on iPhone". Macworld. International Data Group. Retrieved February 18, 2017. ^ Caldwell, Serenity (September 19, 2013). "Get to know iOS 7: Camera and Photos". Macworld. International Data Group. Retrieved December 31, 2016. ^ Baldwin, Roberto (June 10, 2013). "Apple Dials in iTunes Radio, a New Streaming Music Service". Wired. Condé Nast. Retrieved December 29, 2016. ^ Mediati, Nick (January 16, 2016). "Apple drops free iTunes Radio, bundles it into Apple Music". Macworld. International Data Group. Retrieved December 29, 2016. ^ Campbell, Mikey (January 28, 2016). "Apple merges iTunes Radio channels into Apple Music, Beats 1 now lone free-to-stream service". AppleInsider. Retrieved December 29, 2016. ^ Cipriani, Jason (September 19, 2013). "Four features to know about in Safari on iOS 7". CNET. CBS Interactive. Retrieved December 30, 2016. ^ Caldwell, Serenity; Moren, Dan (April 17, 2014). "33 great tips and tricks for iOS 7". Macworld. International Data Group. Retrieved February 18, 2017. ^ Dilger, Daniel Eran (July 12, 2013). "iOS 7 Maps go full screen, navigation gets night mode, new Siri options". AppleInsider. Retrieved February 18, 2017. ^ Hughes, Neil (June 18, 2013). "Inside iOS 7: Apple's Weather app gets animated". AppleInsider. Retrieved December 31, 2016. ^ Caldwell, Serenity (September 19, 2013). "Get to know iOS 7: Phone, FaceTime, and Messages". Macworld. International Data Group. Retrieved February 5, 2017. ^ Kazmucha, Allyson (September 21, 2013). "How to view timestamps for individual texts and iMessages in iOS 7". iMore. Retrieved February 5, 2017. ^ Newton, Casey (October 9, 2013). "Taskmasters: how Israeli intelligence officers helped inspire the look of iOS 7". The Verge. Vox Media. Retrieved February 5, 2017. ^ Rogowsky, Mark (September 18, 2013). "7 Misses In iOS 7". Forbes. Retrieved February 5, 2017. ^ Topolsky, Joshua (June 10, 2013). "The design of iOS 7: simply confusing". The Verge. Vox Media. Retrieved February 5, 2017. ^ Budiu, Raluca (October 12, 2013). "iOS 7 User-Experience Appraisal". Nielsen Norman Group. Retrieved February 5, 2017. ^ Pogue, David (September 17, 2013). "Yes, There's a New iPhone. But That's Not the Big News". The New York Times. Retrieved February 5, 2017. ^ Etherington, Darrell (September 17, 2013). "Apple iOS 7 Review: A Major Makeover That Delivers, But Takes Some Getting Used To". TechCrunch. AOL. Retrieved February 5, 2017. ^ Gruman, Galen (June 14, 2013). "Yes, iOS 7 copies Windows Phone and Android -- get used to it". InfoWorld. International Data Group. Retrieved February 5, 2017. ^ Segan, Sascha (June 10, 2013). "iOS 7 Steals From, Stomps On Competitors". PC Magazine. Ziff Davis. Retrieved February 5, 2017. ^ Etherington, Darrell (September 19, 2013). "iOS 7 Adoption Already As High As 35% In One Day, Apple And Developers Reap The Rewards". TechCrunch. AOL. Retrieved February 5, 2017. ^ "First Weekend iPhone Sales Top Nine Million, Sets New Record". Apple Inc. September 23, 2013. Retrieved February 5, 2017. ^ Hughes, Neil (August 22, 2014). "While 91% of Apple users run iOS 7, five different versions of Android hold 10%+ share". AppleInsider. Retrieved December 29, 2016. ^ Dixit, Pranav (September 27, 2013). "iOS 7 is reportedly making people sick". Fast Company. Mansueto Ventures. Retrieved February 5, 2017. ^ Kaplan, Jeremy A. (September 27, 2013). "Apple iOS 7 is sickening users, doctor confirms". Fox News. Fox Entertainment Group. Retrieved February 5, 2017. ^ Kingsley-Hughes, Adrian (March 15, 2014). "Poor battery life after installing iOS 7.1? Try these simple tips". ZDNet. CBS Interactive. Retrieved March 31, 2017. ^ Cunningham, Andrew (March 11, 2014). "Refinements, additions, and un-breaking stuff: iOS 7.1 reviewed". Ars Technica. Condé Nast. Retrieved February 5, 2017. ^ Esposito, Dom (June 9, 2014). "New lock screen bypass discovered in iOS 7, allows access in 5 seconds under certain circumstances (Update: Resolved)". 9to5Mac. Retrieved February 5, 2017. ^ Matyszczyk, Chris (September 24, 2013). "'iOS 7 makes your iPhone waterproof' ad a scam dunk". CNET. CBS Interactive. Retrieved February 8, 2017. ^ Burns, Chris (September 27, 2013). "iOS 7 Waterproof hoax expands with "AirDrop protection"". SlashGear. Retrieved February 8, 2017. ^ "iOS 7". Apple Inc. September 18, 2013. Retrieved February 8, 2017. "iOS 7". Archived from the original on September 8, 2014. Retrieved March 12, 2011.